Individuals who adjust well to unexpected events generally lead healthy, active, and happy lives after their injury. Individuals who do not adapt well to unexpected events tend to be less healthy, less active, and unhappier after their injury. Unhealthy behavior almost always leads to unhealthy results. When you neglect your personal care, you put yourself at greater risk for developing a wide range of health problems such as respiratory complications, urinary tract infection, and pressure sores. These problems can limit your ability to participate in activities. Substance abuse can complicate existing medical problems or lead to other health problems. When you are first injured, it takes time to get use to your life after injury. Some people grieve longer than others, so the adjustment period is different for everyone. It may take as much as a year for you to accept the realities of your injury. You will also experience a continued process of adjusting to the unique issues that occur in your every day life as a person with SCI. One of the biggest keys to adjusting to spinal cord injury is personal motivation. Individuals who are newly injured are often motivated to attend therapy sessions out of a desire to gain strength and function. You probably have a strong belief that your paralysis is only temporary, and you will soon return to your old, “normal” self. This hope is a common reaction after an injury. Unfortunately, it is far more likely for individuals to recover function based on their level and completeness of injury. In fact, only a few people actually fully recover from their injury. This does not mean that all hope is lost for a full or partial recovery. 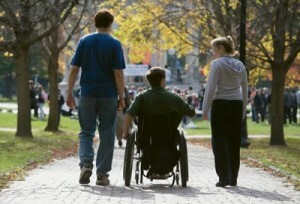 Almost all individuals with SCI continue to hope that they will walk again one day. However, a cure for paralysis may or may not come in your lifetime. A healthy approach to this reality is to move forward with your life after injury with the continued hope that advances in medicine will one day lead to a cure. In other words, do not wait on a cure to proceed with your life! People who adjust well to life after injury are usually motivated to meet personal goals. These goals are different for everyone and often change throughout life. For example, your goal today may be to get a job, and you may want to have children in the future. Itt is up to you to find purpose in your life and the motivation to achieve your goals. It may help to think about what you wanted out of your life before you were injured. For example, you may have once strived for good health, an enjoyable job, and a loving family. There is no reason that you cannot continue to strive for the same things now that you have a spinal cord injury. As an individual with SCI, it is important to recognize that your injury also has a tremendous impact on your family. Although they may not have to adjust to losing the use of their hands or ability to walk, your family may experience a loss of the way their life was before your injury. For example, they may have to adjust to the role of caregiver. They may need to work to help with family finances. All of the changes that they face can lead to added stress and anxiety. As your family comes to accept the injury, they face issues of adjustment similar to those you may experience. Children are naturally curious and adjust to events by asking questions. They ask questions because they make few assumptions about how the injury impacts their life. Therefore, children adjust rather quickly to an injury if their questions are answered in a clear, honest manner. If you are a family member, healthy family adjustment is, essentially, taking care of you. For example, you can take time away from your loved one to do those things that you enjoy. You can help minimize your stress and anxiety by working to replace your own false assumptions, unrealistic ideas, and irrational beliefs. You can start by learning the facts about SCI. Then, challenge your irrational beliefs with evidence to dispute your beliefs. Finally, replace your false information with facts. Hopefully, you will soon discover that you too are living a healthier, happier, and more satisfying life. No matter if you have a spinal cord injury or not, you have control over your life by choosing how you want to think about your situation. You can be happy and more hopeful about your life, but it will only happen when you work to make it happen. Your thoughts, feelings, and behavior do not change overnight. It takes time to grieve your loss and come to accept the realities of the injury. Then, you face a continued process of adjusting to everyday issues of living with SCI. If you avoid false assumptions, unrealistic ideas, and irrational beliefs, you will give yourself more opportunities to reach your goals and have the life that you desire.